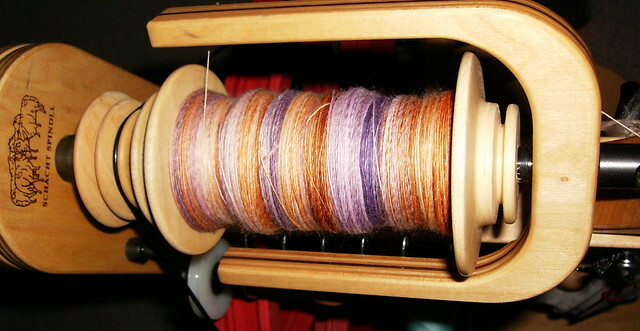 I started spinning again after a hiatus. I’ve just been so excited about all the new batts that I just had to try some for myself! I’m always curious if I’ve got a good blend. Do I have enough angelina or too much? did I distribute it well? What happens when I put recycled fabric strands in? 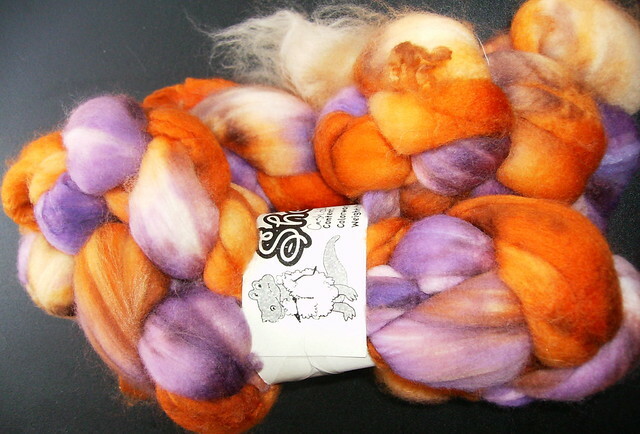 I’ve been making a couple of my spinning friends be guinea pigs, but really I want to spin them! So I guess it’s been long enough that Denby and Kiara just had to know what I was doing. If I’m sitting in a chair, Denby likes to come up behind me and put his paws on my shoulders just to say hi. I scares me every time. I had a ton of fun yesterday at the Brooksville Pioneer Day even though it was cold. Yes, it gets cold here on occasion. Thanks to everybody who came by to say Hi. I’m sorry I didn’t catch everyone’s name. Lorel came up with me from Orlando to sit and spin. 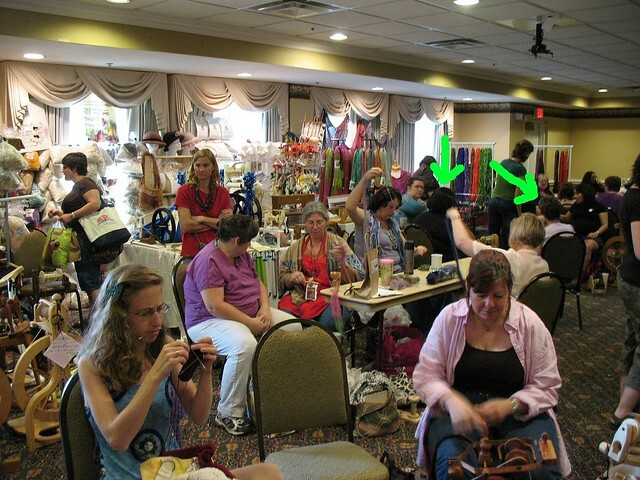 We had a few other spinners with us as well as a weaver, a crochetter, and a lucet knotter. There was cow milking right behind us which then then churned into butter and ice cream, a turkey caller, and authentic camp of a trapper, a mini barnyard, palmetto leaf weavers, acorn bread, a Seminole, corn husk dollies, and a quilting bee. I was surprised how many of the spectators dressed up. Everyone was super nice and all the kids were curious to try out our drum carder. I think I had the best pulled pork sandwich I’ve ever had. 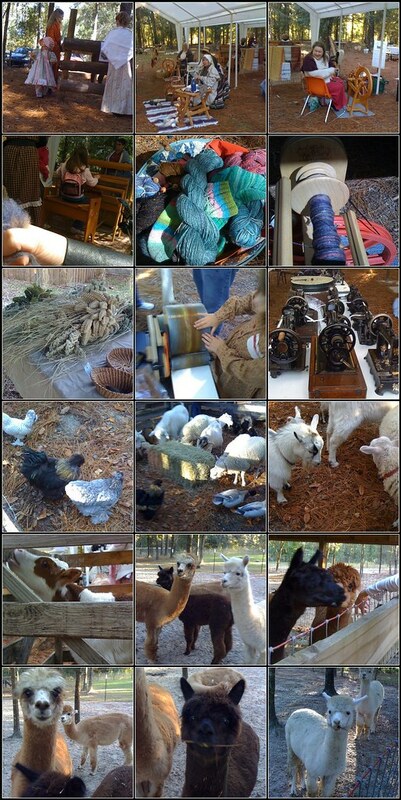 After the festival, I went to see Kimberly at The Woodland Hills Alpaca Farm . She is a most gracious host and I picked up a ton of goodies from her. If you ever feel like you need an education on how to pick a fleece, she is an excellent choice. I’m excited to be dying some of the fleeces that I picked up. 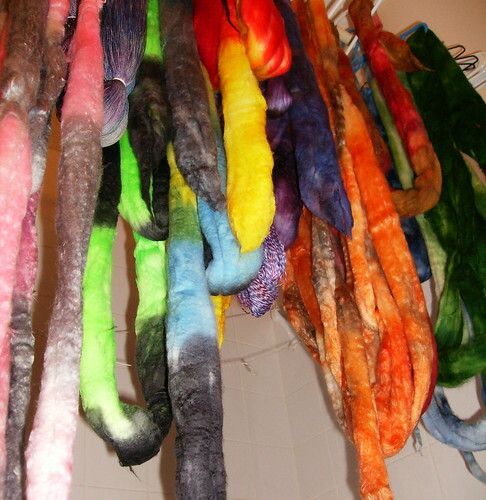 I promised to show what I’ve been spinning lately, which honestly its been a few weeks and these have just been drying in the tub. I guess I’ll make up for it this weekend at the festival. 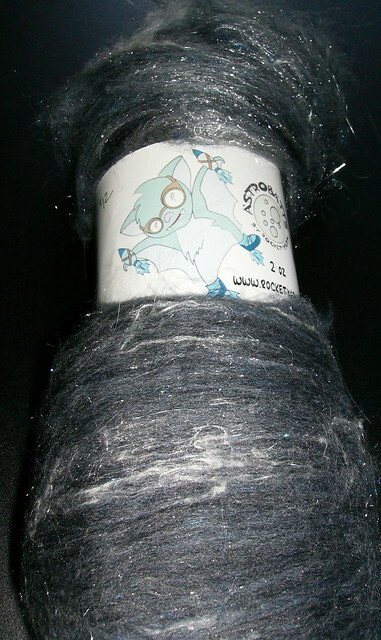 This is Rocket Yarn’s Batt –they’re very loosely carded crazy batts. I picked up 2oz at the Fiber-In this year. Hanks Yarn has them on occasion. I love her label and the two colors of angelina in the batt. I’ve had other batts where the angelia is all bunched up in one spot and make for weak and scratchy yarn, but hers are well blended and balanced. 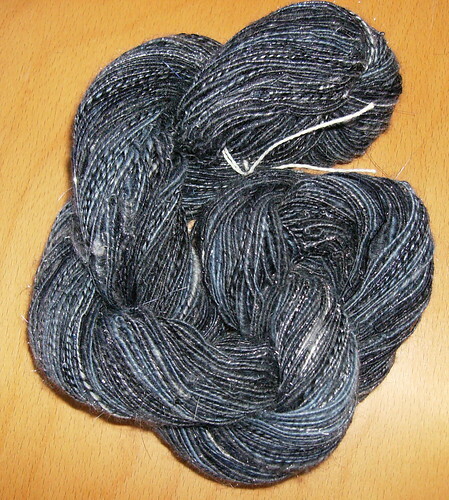 I core spun it around a black handspun single. The next one is from my own batts . This particular one is from some teal BFL that we dyed a few months ago blended with some of the samples from the September Phat Fiber box. 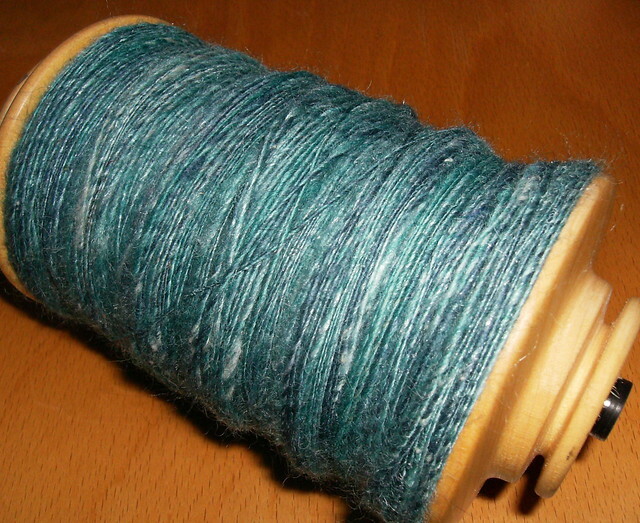 I spun it as a really thin single thinking I could core ply it around some lace weight jaggerspun. I’m not sure what i was doing wrong, but it came out all bobbly instead of a good round yarn. I’m still debating on how to ply the rest of it. 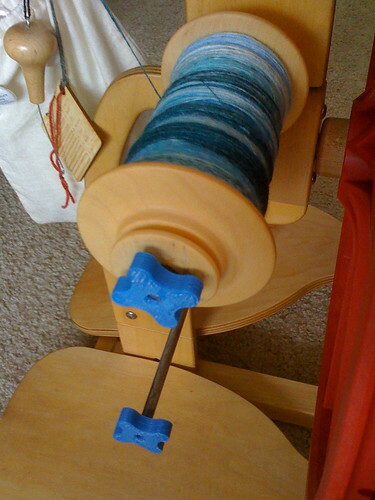 I’ll probably end up doing a navajo ply on it this weekend so i can have my bobbin back. The next one is another from one of my batts made of a rasberry bfl and Phat Fiber samples plus some ginned cotton that one of my Ravelry buddies sent me. 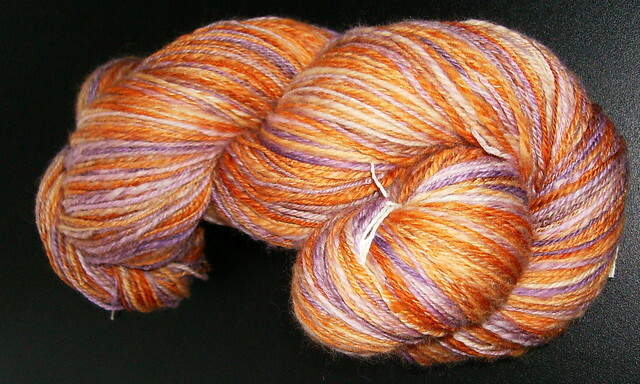 And finally a thanks to Dyeabolical Yarns for using my picture and mentioning us. 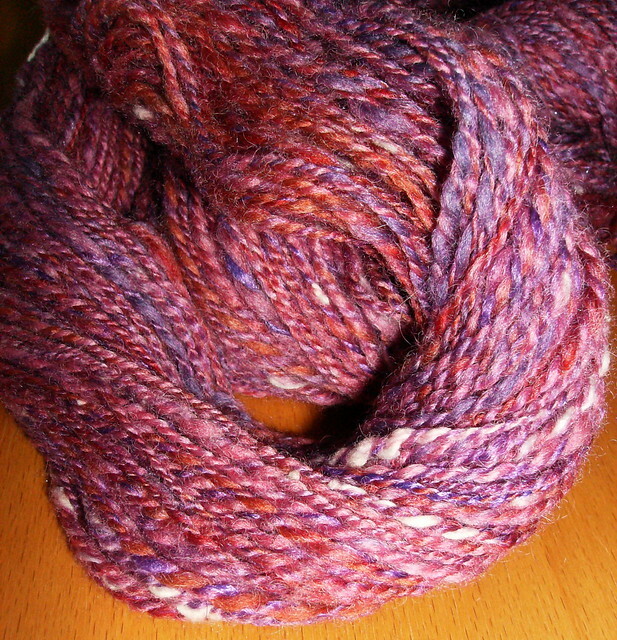 This was a gift from my MIL and I spun up some of her roving earlier this year. 3 ply sock weight. 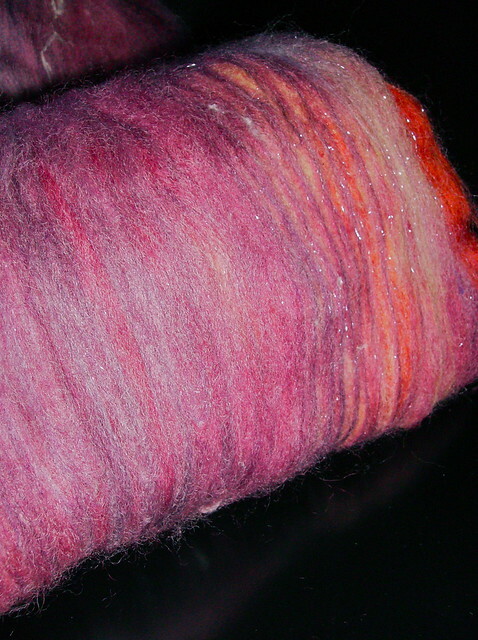 I’m slightly belated in talking about the 2010 Fiber-In, but all my photos were out of focus. I’m borrowing one from Lorena who owns Haldecraft on etsy. Thanks Lorena! It was a really cozy show with about 6 vendors. Some were representing a few companies. Hank’s (which I’m just sick that they closed their brick and mortar store) was there with their hand dyed as well as Rocket Yarn. We brought our pair of ladybugs and sat and chatted with Continental Kim. 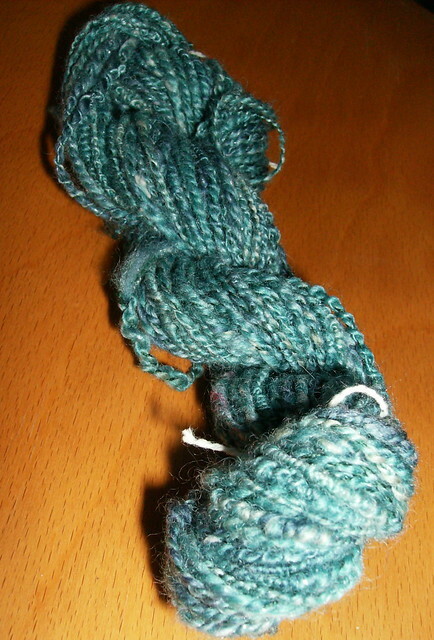 I got a lot of mileage done on my latest batch of alpaca/superwash merino blend. It’s drying in the bath right now, but should be out and about in a few days. 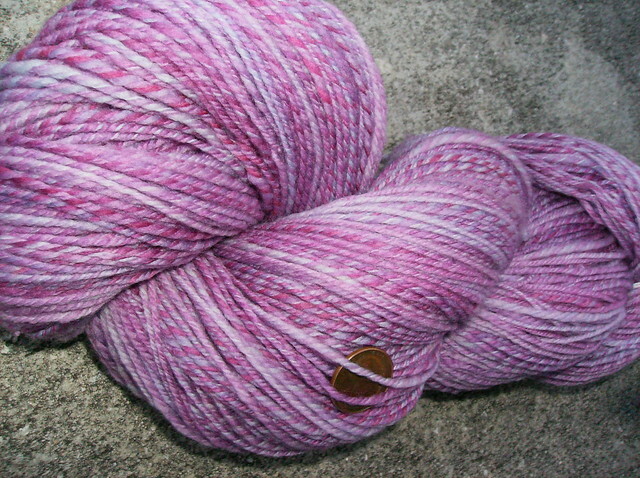 I picked up a little Angelina, and some dyed locks with a new drum carder in mind. That should be a fun addition! I just finished counting how many yards I got off that bobbin… 406!! It’s going to make a perfect pair of socks. and now for a color update!! We’ve been dying to get ready for the September Phat Fiber box, so I can’t show everything (and it’s killing me) but here’s a quick pic of what will be out soon. My plastic nuts for my Ladybug’s Lazy Kate have been popping off ever since my husband installed the kate on my wheel when I wasn’t looking. I have to preface this with the fact that I’m the handy one. He’s a programer. He’s a fantastic programer (and set up this site for me), but I own the 18 volt cordless drill and have since my freshman year of college. Anyway it’s been bugging me that the nuts have been disappearing in my car every time I take it on a trip. So my brother made me new ones!! He has a Cupcake Maker Bot and makes cool stuff. It’s basically a 3-D printer that shoots out a spaghetti string of heated plastic. I thoroughly approve. He’s promised me some silly shapes as well. Thanks Steven! 440 yards!! of pure yumminess. Makes me wish they’d invented Touch-O-Vision instead of Smell-O-Vision…oh wait…. Our crack arrived! 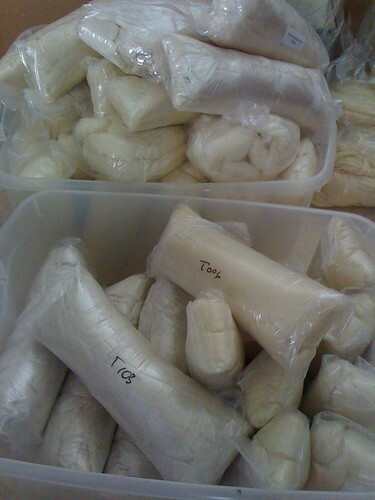 Just kidding– this is actually our first shipment of fiber from our supplier. I can’t be happier with the quality of it. 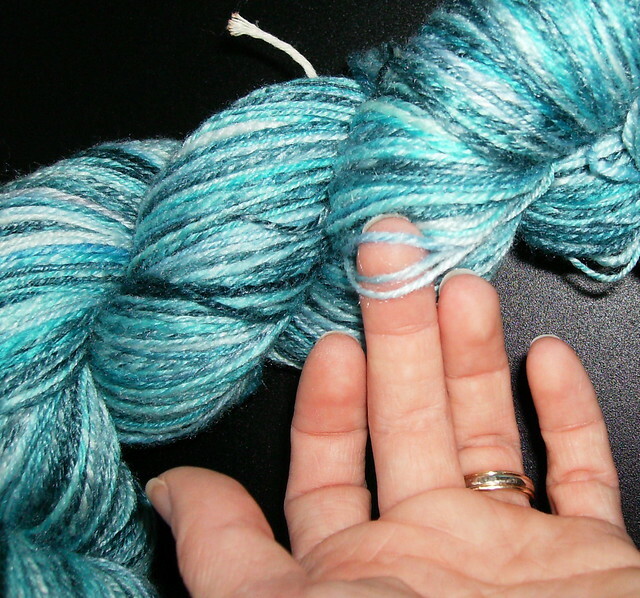 We have merino wool untreated and superwash, BFL, seacell, and a gorgeous cashmere blend. I can’t wait to dye! You are currently browsing the archives for Spin me right round.